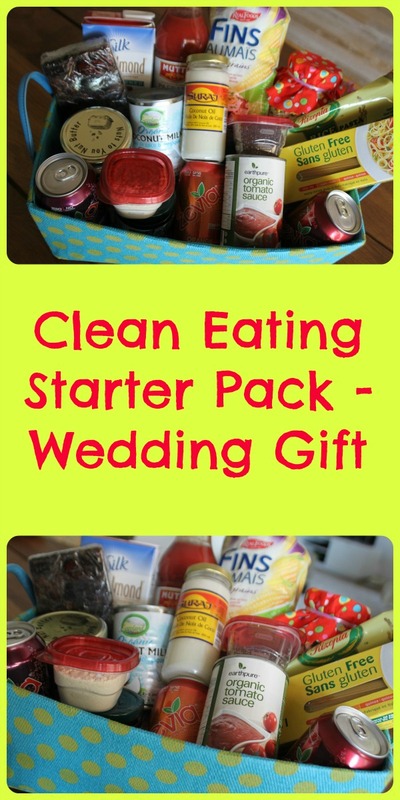 MamaEatsClean: Sunday Week in Review - On hold while I celebrate my Little Brother Getting Married and A Clean Eating Starter Pack Wedding Gift Idea! Sunday Week in Review - On hold while I celebrate my Little Brother Getting Married and A Clean Eating Starter Pack Wedding Gift Idea! My baby brother is getting married this weekend. So its going to be a crazy weekend. My little girl is the flower girl. A once in a lifetime event that I want to savor. So no time for blogging. And no time for a proper Sunday Week in Review. But I do have time to share with you the gift I am giving my brother and his new wife: a Clean Eating Starter Pack. They have already jumped on the clean eating bandwagon to an extent. But this is just a little help to keep them going on it a little further. Because the best way to keep a marriage working is to feel your best. And you will feel your best if you eat clean. So really - a basket full of goodies (in my eyes anyway) is a great wedding gift. Don't you think? Here it is with a little write up I included for them so they know what they are getting and why. I know you guys have already started on the Clean eating by reducing your consumption of processed foods. Good for you! Way to go! Filling your pantry with clean essentials can be time consuming, confusing and expensive….especially if you don’t live in the city. So I did all the leg work for you for Phase 11 - reducing your consumption of wheat and sugar. Because I know Callan really wants to cut back his sugar – ha ha! Here are some of my favorite clean ingredients that I have discovered, use almost everyday (for me and/or the kids) and want to spread the word about…………..
· Unsweetened Almond Milk – a great non-dairy alternative to cow’s milk and soy. Very few people really tolerate cow’s milk well (nudge, nudge, hint, hint). Do you? You can use almond milk anywhere you would use cow’s milk – baking, cooking, drinking, smoothies, etc, etc, etc. And make sure you get it unsweetened because you don’t need any more added sugar. Just add some Stevia if you need some sweet. · Almond Hazelnut Butter – Peanuts are moldy and acidic. If you must have peanut butter buy it natural (no added sugar). But I dare you to try this almond hazelnut butter and not be in love with it. Use it in smoothies, protein bars, granola bars, “sandwiches” – wherever you would use peanut butter. · Coconut Oil – the benefits of coconut oil are too many to get into. Just trust me. The only oils you should be using are coconut, organic extra virgin olive oil and butter. Get rid of your margarine. Get rid of your canola oil. You can use coconut oil in place of it. You can use it in baking, cooking, frying. You can even use it as moisturizer. · Organic Tomato Sauce and Strained Tomato’s - I know you have a garden so you are probably way ahead of me here. Just a little reminder to buy organic when you can. Avoid canned goods when you can (they contain BPA). We do live in Manitoba so it’s obviously hard to get fresh tomatoes year round. And watch your labels. Try and avoid added sugar and wheat when you can. That means making your own spaghetti sauce, pizza sauce, bbq sauce and ketchup. It is pretty easy to doctor up tomato sauce. · Organic Canned Full Fat Coconut Milk - This stuff is magic. It works in place of cream for soups and cooking, whipped cream in desserts – the list goes on and on and on. It is filling and delicious. I always have a can in the fridge. Yummy. · Blueberry Fruit Spread - This brand has absolutely no added sugar. And no artificial sugar. Crazy. Again – watch your labels. They sneak stuff in. · Corn Thins - I’m not crazy about corn in general. But if you haven’t gone grain free (yet – we’ll get to that in Phase 3) and you are looking for a non-glutinous alternative to wheat products then these Corn thins might be up your alley. When you are buying corn products make sure you are buying Non-GMO. These corn thins make a good snack with some almond hazelnut butter and blueberry fruit spread. · Gluten Free Pasta - If you are still on Phase 2 and holding onto your grains, make sure you are using non-glutinous grains. The best alternatives are buckwheat, brown rice, quinoa and millet. I gave you a sample of spaghetti noodles to try instead of wheat spaghetti. Or why not just roast a butternut squash, make zucchini noodles or steam some broccoli slaw ? Now we are talking. · Zevia – If you are having troubles giving up pop or just need something refreshing to drink other than water with lemon try a Zevia. I gave you a sample of Orange, Black Cherry and Dr. Zevia. It is sweetened naturally with Stevia. · Dates – Use these as a natural sweetener in baking, protein/energy bars or in smoothies. Delicious. · Chia Seeds – This is my all time favorite SUPER FOOD. I eat 2 to 4 Tbsps of these a day. They turn into a gel when mixed with water or unsweetened milk. You can make puddings out of them, use the gel as a replacement for eggs or use them in baking and smoothies. They are super high in fiber and give you tons of lasting energy. If you don’t like the texture then grind them in your coffee grinder. · Organic Coconut Flour – Other than blanched almond flour this is the best gluten free “flour” replacement out there. It contains tons of fiber and is relatively low carbohydrate and low calorie. It is super filling. I use it in lieu of breadcrumbs in meatballs and burgers, to make pancakes, cakes and muffins, and anywhere else I can think of. This stuff is awesome and unlike almond flour it is low”ish” in fat, cheap and pretty easy to find. Buy organic if you can. By Christmas you guys will be feeling so good you will be begging me for Phase 3 for your first Christmas gift as husband and wife. Maybe a little Roasted Chicory Root instead of coffee, Almond flour, hemp seeds and a blender. But in case I am freaking you out and you think this is the WORST wedding present anyone has ever given, then just check your envelope. I didn’t spend all of your presentation money on clean food. And I did throw in a batch of confetti cookie mix – only to be used in case of emergency. Or to celebrate something. Like a wedding perhaps. Good luck on your adventures in the kitchen and as husband and wife! Cauliflower, Curry, Candida and Canada!